There are some very nice personal advantages to working here, among them, these. First, the camp is tranquil, despite all the baseball, and beautiful–quite isolated, surrounded by scrubland and forest, with lots of birds, woodpeckers and yellow thrushes especially, making their homes in the trees. Next, we’re only a 5-minute ride from a beautiful beach–swaying palms, turquoise waters, and gentle, cooling breezes. Finally, living at the camp 24/7 naturally leads to good friendships with many of the players. That’s also a downside. A number of players have been released lately, dropped from the academy and sent home, mainly due to lingering injuries that just never fully healed and negatively affected their performance. Some of these guys had become good friends, and when I found out they were leaving, I shed a tear or two. Three in particular, who were released in the past month, stand out. First is Jean Paul Conde, a handsome and friendly 19-year old Venezuelan pitcher with a confident attitude. With his dashing good looks, he would have been a major celebrity if he had made the big leagues with the Yankees. Here’s a shot of a rental car with Jean Paul on the left, Richard Martinez in the middle and Nixton Perez outside the car (all from Venezuela), along with a few chicas that Jean Paul had attracted. Then we lost Andres Varilla, an outspoken and high-strung Venezuelan. He is a good English speaker and we had more than a few discussions about Venezuelan and American politics. He plans on going to university and he’ll do well in whatever he decides to do. Here’s a photo of him (on the right) and Jean Paul with Reggie Jackson from November, 2006. Finally, my favorite player was also released a short while ago. Juan Lopez, from Nicaragua, is such an easy-going, friendly 19-year old that no one could help but like him. He speaks decent English and helped me out in a few of my beginner classes. I was taken by surprise and stunned when I found out that his smile and optimism would no longer grace the camp. 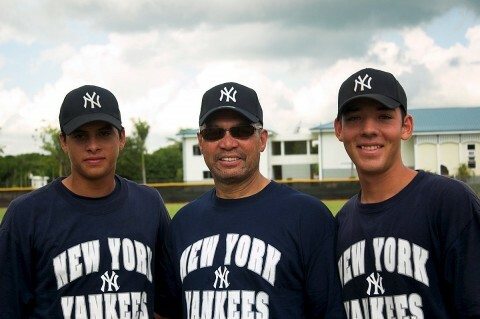 Here’s a photo of him (on the left) with Gabriel Tatis, a Dominican player. Of course, I wished these guys well when they left, and I’m going to try to keep in contact with them vie email. Unfortunately, there are many more players who have become friends and whom I must leave in a few weeks. I never thought that would happen when I first took the job. It’s going to be a bittersweet departure from the D.R. More later.